First, let’s start out with one you many not have expected! Did you know that alpacas fiber is fire resistant?! This is just another reason that using fiber from alpacas to make clothes is a good idea! They meet the standards of the U.S. Consumer Product Safety Commission's rigid testing specifications as a Class 1 fiber for use in clothing and furnishings. So, while you’re feeling comfy and cozy in your alpaca sweater, you’ll also be free of fire (and hopefully you wouldn’t need to worry about that in the first place!). Make sure to enjoy that bonfire in your favorite alpaca wear! Next up! Let’s talk about the history of alpacas a little! Alpacas have a very interesting history as they were domesticated by the Incas more than 6,000 years ago and raised for their amazing fleece! Naturally, because alpaca fibers are so durable and gorgeous, most of the fleece was reserved for the elite and Inca royalty! It is amazing that alpaca fiber was used do exquisitely! Lastly, I want to mention how alpaca fiber is hypoallergenic which is very important to many people now a days! It makes a wonderful gift for this reason. Imagine how lovely it will be while wearing your favorite alpaca fleece gear and feeling warn but definitely not itchy! We all know that feeling, and personally, we could all benefit from making the switch to alpaca wool (especially our itchy skin!). 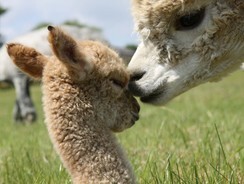 Alpacas have a rich and interesting history that spans back many amazing years! Do you have a fun and interesting alpaca fact to share with us? We’d love to hear them!